While Muslims generally live for their religion and abide by its many laws, none ever learns about a loving God. So when two devout young Muslim men heard the news for the first time in their lives earlier this year—from the Pope, of all people—they couldn't believe their ears. 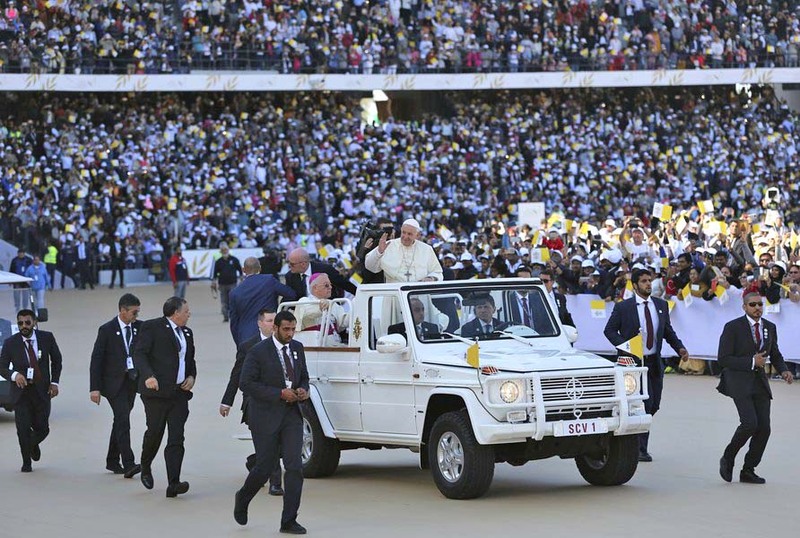 Pope Francis made a historic visit to their country, the United Arab Emirates (UAE), in February. This first-ever papal visit to the Arabian Peninsula, the birthplace of Islam, made headlines in many ways. Around 135,000 people attended a service at a massive sports stadium in the capital city of Abu Dhabi—many of them Catholic migrant workers from places such as the Philippines and South America*, as well as about 4,000 Muslims. The young Muslim men decided to join the crowds at the service and had every intention to cause mischief and challenge the Pope's teachings on Christianity. How could this Christian leader dare come to their country and speak against their Sharia laws? While the UAE’s constitution establishes Islam as the country’s official religion, it also, officially at least, guarantees freedom of worship to those of other religions. Yet as we have reported in other stories, strict laws exist against proselytizing by non-Muslims, blasphemy and converting from Islam: all considered serious crimes punishable by death. Due to traffic congestion, however, the young men had to settle for watching the ceremony on a large screen outside the stadium grounds. As soon as the pope concluded his speech, they attempted to leave quickly but were again thwarted by the throngs of people. So they had to wait until the service concluded. By that time someone had passed one of them a note, which the fellow simply pocketed without looking at it. When the young Muslim men returned home, they began reflecting on the words they’d heard about Jesus bringing love to humanity, and how the pope explained Jesus had come to defeat fear, sin and death by the power of God's love. This was all news to them! Their conversation went on and on. How about where he said Jesus came poor, but wealthy in love; that He came to serve, but not to be served? That he healed many, but not himself … allowing himself to be wounded and even put to death! The whole concept of God’s love for humanity was utterly foreign to them. They had never heard of nor known a loving God. They learned from their Islamic upbringing that yes, God is beneficent and merciful, but never that He was loving. “For God so loved the world that He gave his only Son Jesus, so that everyone who believes in Him may not perish but may have eternal life” (John 3:16). “Since, therefore, the children share flesh and blood, He himself likewise shared the same things, so that through death He might destroy the one who has the power of death, that is, the devil, and free those who all their lives were held in slavery by the fear of death” (Heb. 2:14-15). As they talked, they sensed an unusual power moving among them. They decided to call the cell phone number printed on the back of the tract, which happened to be for a Bibles for Mideast pastor in the Middle East. They spoke at length with him, and asked if they could meet him. He told them to pray to God the Father to show them the truth, the way to salvation and eternal life. He said that in three days, they could get together. The pastor and the ALG (Assembly of Loving God) Church spent the next three days fasting and praying for the eight young men. When the three days were over, the men met with the minister at his church and heard the gospel message. All eight readily accepted Jesus into their lives as personal savior and Lord! An awesome power engulfed them as they did, and all were filled with the Holy Spirit. For the last month, each has been secretly studying the word of God, and just last week all were baptized. The new believers want to be involved in our Lord’s ministry and are waiting on God for guidance on what steps to take next. They know that persecution will be fierce and that their lives are now in serious danger. Please pray for them: that our Lord will guide, protect and provide for them in all ways. * A large migrant community in oil-rich UAE works building gleaming new towers or as domestic help, often under harsh or discriminatory conditions.